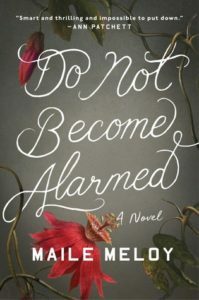 I guess I’m a sucker for lists because Do Not Become Alarmed (2017) by Maile Meloy also came off a list. This list had something to do with gripping or fun summer reads. I first heard of it when we were discussing what to read for our next book club. I remember that we widely rejected it for book club because it involved children in danger, and the parents in the group had no interest in imagining their own children in similar situations. I figured I could read it for myself. Part of my interest stemmed from the fact that I was about to go on a cruise and Do Not Become Alarmed involved something terrible that happened on a cruise. I was curious about what kind of horrible things could happen to me on my next vacation. The book begins with two families of four who decide to spend the holidays on a cruise ship headed to South America rather than visiting family or fending for themselves. Liz and Nora are cousins and close friends. Liz directs most of the action and plans the trip. She is a producer (or something?) in Hollywood. She is married to Benjamin, a supportive nerdy type, and they have two kids. Simon is eight and diabetic and Penny is eleven. Penny is very much like her mother, precocious, bossy, and a natural leader. Nora is married to Raymond, a black man [the mixed-race marriage and kids becomes a plot point later] that she met through Liz. They also have two kids about the same age. Marcus is the same age as Penny and June is only six. While on the boat they meet up with a South American family. That couple also has two kids, but they are older. Isabel is sixteen years old and her brother is seventeen(?). The women take the kids off on an excursion while the men go golfing. A number of events occur, a number of decisions are made, and the end result is that the children disappear. They may be in the hands of a dangerous drug dealer/smuggler. The next part of the story primarily focuses on the children and how they react to their situation, although Meloy does not forget about the parents and what they’re going through. With the children in danger, I was not putting this book down. It was definitely a page turner, and Simon’s diabetes adds an edge to every situation. I thought Meloy did a good job in separating out the characters, their personalities, and their reactions to what was happening. I was never bored. I had some problems nailing down the tone in this book. At times I felt that Meloy was making a statement about rich, privileged Americans. The two American couples go on one of the least interactive forms of international travel. They choose an excursion in one of the safest countries after not even leaving the ship at the last port. They seem paranoid and overly cautious about everything. And then the worst happens to them. Does Meloy think their caution is reasonable? Are we supposed to empathize with them? Is Meloy saying that bad things can happen anywhere, anytime? You can never really protect yourself? I don’t know. I was disturbed that Meloy had Isabel raped in the book. This is a summer thriller. Sure, the children were in danger, but I wasn’t actually expecting any of them to suffer permanent physical or psychological damage. And then she throws that in, and I was unprepared. It made me feel sick. Again, I wasn’t sure if Meloy was trying to make a point about how lucky Americans are when she killed off Isabel’s brother and then raped her, or if she just didn’t want to do anything to the American kids. Why did the South American children get the raw end of this deal? I would have been perfectly happy if they’d all made it through relatively unscathed. You can read all of my reviews on my blog. Share the post "Not the best book for parents"